Not what I was expecting but wonderful anyway! Nice one! It made for a captivating reading..infact my stumbling upon this article coincides with an apparently not so significant event that happened a few hours back..It so happened that I was having a discussion with one of my friends with respect to the usage of the salutation “Tasleem” and the other Gentleman made a statement that it’s used only by the noble Women and that too it has become almost rare..to which I was not very convinced..Now this article puts the ambiguity continuing in my mind to rest by mentioning the scene..Where the protagonist Raj Kumar Sahab greets the object of his desire/reverence as “Tasleem”..anyways a really wonderful piece of writing.. Thanks Rahul! 🙂 Actually, the word is almost totally out of use amongst North Indian muslims in the regular everyday context…To be honest I didn’t even know what it meant when I first heard it in the film…This apparently was not formerly the case, and though ‘Tasleem’ was a respectful address (sort of like a combination of ‘salaam’ and seeking admission) it was far more frequently used, and not just amongst the upper echelons of society…this is my impression at least…. Perhaps you are right..infact I have been in Lucknow for the last almost 5 years and it so happened that on a few occasions, got to see the usage of this specific word..My impression about this word was that it is used in a semi-formal occasion when the other person doesn’t necessarily be greeted in an utmost formal fashion..and yes on a concluding note..would like to mention that your comments are reflective of an intricately ornate mannerism..
Well going by your interests..perhaps it would make sense for me to recommend the names of two other classics which encapsulate the essence of an era long bygone..they are “Mere Huzoor” and “Umrao Jaan”. Apart from the above, two other classics of my personal choice for their essence and lyrics would also warrant a reference here..they are “Kabhi Kabhie” and “Aandhi”..for this comment would have been incomplete without having mentioned them on a concluding note. Thank you for the recommendations! I saw ‘Kabhie Kabhie’ as a child, don’t remember that much of it….and should certainly give it a rewatch. ‘Aandhi’ I had not heard of, but it certainly looks interesting. I have seen both ‘Mere Huzoor’ and ‘Umrao Jaan’ and didn’t really care for either. Raaj Kumar admirer as I am, I found ‘Mere Huzoor’ insufferable and this is basically how I feel about pretty much all of the ‘Muslim Socials’ of the 1960’s….some lovely songs and genuinely funny Johnny Walker side plots were their only redeeming qualities….I wouldn’t go to the extent of calling ‘Chaudvin ka Chand’ cheesy and affected like all of the others but some lovely songs and brilliant camera angles can’t make up for a messed up plot and lack of substantive content. ‘Umrao Jaan’ is different in that it is a well-made, well-researched film with good performances as well as good songs…I don’t quite how to explain myself but it just didn’t really have any effect on me…I guess the plot didn’t really appeal to me, even though it’s apparently based on real-life courtesan Umrao Jaan Ada. I really hope I haven’t offended you with my blunt comments… A lot of people really like ‘Mere Huzoor’ and most people regard ‘Umrao Jaan’ as a classic…I guess likes and dislikes vary…Thanks again for your comments 🙂 and I’m looking forward to seeing both ‘Kabhie Kabhie’ and ‘Aandhi’…. and what mean “Torgibaazi or Turkibaazi”? Yes..her dialogues when she returns to the Gulabi mahal are very memorable ones…”Mai bhi aisi khuli hui kabr ki ek besabar laash hun jisse baar baar zindagi warghala ke bhagha lejati hai”/ “I am one such restless corpse of an open grave, lured by life again and again” . I don’t think the words ‘torgibaazi’ or ‘Turkibaazi’ appear anywhere in the film. Perhaps they were there in the subtitles, or in a dubbed version of the film? warghala kar bhaga le jaati hain. 1-Mughal-e-azam after dancing Suraiyaa what say Salim to durjaan? 1) Suraiya doesn’t dance in the film. Do you mean the scene which follows soon after the ‘Mohe Panghat pe’ song, where Suraiya informs Saleem of Anarkali’s feelings, and Durjan is present? 2) Salims’s grandmother says ”Rasulan, e bua ab le bhi aa”. Rasulan appears to be the name of the maid or domestic help. While ‘bua’ can mean aunt, it is in some contexts used to refer to domestic help. Salim’s grandmother is just asking Rasulan to bring something (probably some food item). Unless you stop this dangerous game, the rumours will begin”. Suraiya singes(Lata) “ae ishq yeh sab duniya waale”. It is deleted scene in color version. If you have not B/W version don’t worry.Thank you very much. What is TAQTI?Is this correct? Taqti=tika=maang-tika?. Thank you for expressing your beautiful insight on this masterpiece. I am a modern day courtesan, and I feel the words and emotion so deeply from this film. Yes, Salim is truly doing the work of God by accepting Sahib jaan and fighting the barriers of society to protect her. It is a moving film, thanks for your appreciation. Veerbadhra. I approved your comment. I don’t know why it isn’t appearing..Maybe somethings up with wordpress? I agree…Salim was awesome. 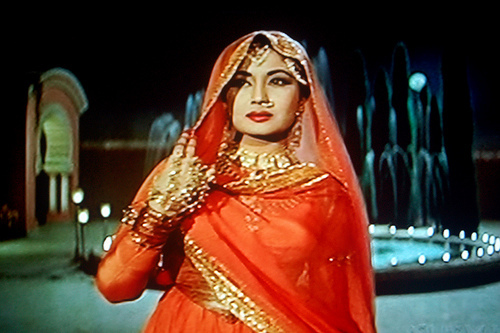 If I have to name one perfect Hindi film – it would be Pakeezah. From casting to acting to music to dialogues to direction it is simply unmatched by any other movie. From an objective view point I would place ‘Pakeezah’ amongst the top ten Hindi films ever made. Personally, it’s my favourite Hindi film (but here a fair bit of subjectivity enters). It is, as you say, a beautiful film. There’s a lot to love and admire about it.